Open Calls for Fall 2015! Theme: In addition to other work you are showing that month, each participant will exhibit one featured piece that is at least 36″ by 48″ in size (larger work is acceptable). 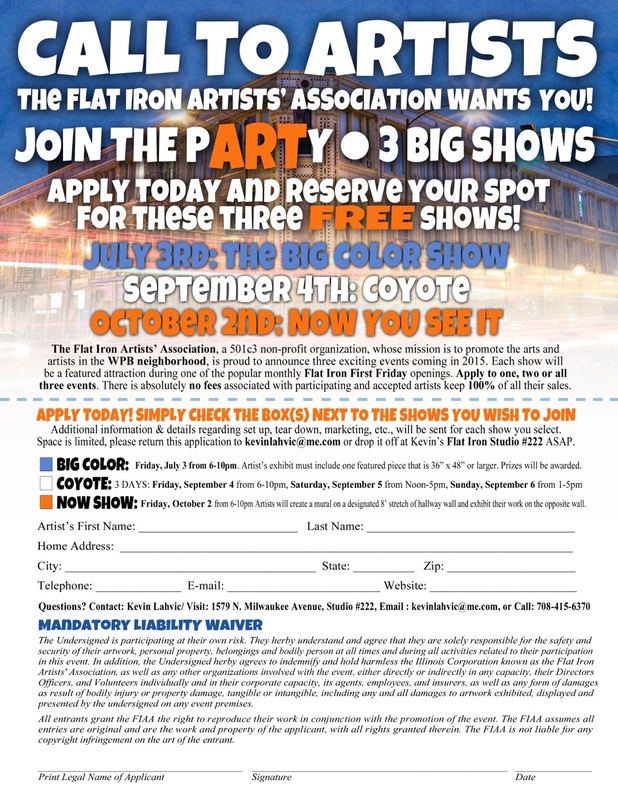 PRIZE AWARDS: There will be an independent judging of the Big Color entries the night of the show and 3 prizes awarded. Prize amounts are yet to be determined. Additional Info: Provide a JPG image of your Big Color piece in an email attachment to:charlie@charliereesart.com* by June 15 and we will include you in show promotions and post it on social sites. *Be sure to include the title of the work, dimensions, medium and the artist’s name in your email. Theme: The Flat Iron’s Annual 3 day Fall Festival, a WPB tradition. Additional Info: Participating galleries are encouraged to submit a short description of their planned exhibits and activities by August 1. The information will be included in the show program and social sites posts. Theme: Participating artists will be assigned approximately 8′ of hallway wall space in the Flat Iron to create a section of a mural that will run throughout the building. Painting will begin on September 7 and must be completed by September 30. There will be some donated acrylic paints available, artists can also use their own material. Each mural artist will be responsible for painting over their section. White wall paint and rollers will be provided. Paint over to be completed between November 7 and December 3. Additional Info: This event and all participating artists will be listed in the official program for Chicago’s Artist Month, which is widely distributed throughout the Chicago area. To enter, print out this form and submit to door #222 inside the Flat Iron Arts Building, or email to charlie@charlesreesart.com! Previous Previous post: First Friday, May 1st at the Flat Iron is On! Next Next post: New Event: Portrait Drawing Circle!